Amy Davidson: "I have been quilting for about 13 years. I started by teaching myself some quilting and getting a job at a local quilt shop. I took lots of quilt classes and picked the brains of all the teachers I could. Soon after, I started teaching quilting classes. I enjoy this very much. I truly love to see the "Quilting Bug" catch on. I still teach as often as possible. Mostly I teach my own patterns at guilds and shops around the country. I have been designing quilts for quilt fabric companies and have had a few quilts published in quilt magazines. This is a great way to get to play with a lot of new fabric before anyone else! Could anything be more fun?!?" This wonderful quilt comes to us from Amy Davidson, Queen Bee of Humble Bee Quilt Works. 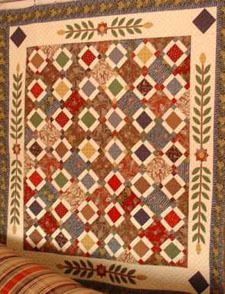 Amy originally designed this quilt for P&B Textiles to showcase their Antebellum fabric line. The photo shows her quilt featuring those fabrics. Enjoy this reproduction pattern from the post-Civil War era, and check out Amy's website for more great patterns! Finished Quilt: 64" x 70"